This is neither a fairy tale, nor a documentary on wildlife. It is a story of four farm boys from Fifteen Mile Creek who willingly chose to fight in a war, which claimed some 620,000 lives. Although some were recent immigrants, all were Americans. The American Civil War lasted four years, but took nearly as many American lives as the rest of the wars in our 230-year history combined. This includes both World Wars, Korea, and Vietnam. But, as horrific as these figures are, they come nowhere close to painting the “real picture(s)” of The Perdition, as it actually was. Perhaps a picture is worth 1000 words, but neither pictures nor words are adequate to explain to current generations of Americans just how barbaric, inhumane, and sanguinary that "The War For Southern Independence" was. Even writers and poets of the 1860’s admitted that they were unable to “capture on paper” the true horrors of the war, which they actually witnessed. Walt Whitman, the famous American Poet (and infamous New York Abolitionist) was one of these. In August of 1861, four, young, Southern Patriots walked away from the fields of corn and cotton. They intended to wage war against the dastardly and pusillanimous forces of The North. They could not possibly have known what the next four years would bring. No one did. Less than 3 years separated the four. The youngest was not quite nineteen. They were close in years, but closer in blood. All were Great-Grandsons of Jonas Bird, Sr. and a Native American Maiden named Mary. Jonas was a trapper and fur trader of English descent. He is thought to have fought in The Seven Years War, as well as in The American Revolution. He resided in Virginia and North Carolina before settling near Fifteen Mile Creek, in the years following The War For Independence. Mary is thought to have been a member of one of the Indian Tribes, which were native to the Eastern North Carolina Region. She may have been of Tuscarora origin, since this is one of the few tribes in this area who were friendly to the American Colonists. However, that is not known for sure. Allen Wilkinson, Joshua Daughtry, Berrien (BerryAnn) Daughtry, and William J. Bird were the four brave lads who answered The Call of The Confederacy. The Daughtry boys were brothers; Allen Wilkinson was their first cousin; (while) William J. Bird was a third cousin. Parker Bird, William’s Father was the only slave owner, even though at one time Allen’s Stepfather, (the late) Hezekiah Parrish had possessed twenty or more on his plantation which was located in both Bulloch and Emanuel Counties. By this time, news of the Southern victory at First Manassas had “ignited” many of the young men in both Bulloch and Emanuel Counties. They wanted “to get in on the fighting before all of the Yankees were licked!” Even though most folks from Emanuel had been opposed to secession, by now they were as eager as the boys from Bulloch “to do their part!” In those days, Fifteen Mile Creek was often the “county line” between these two adjacent counties. These boys had both friends and relatives on both sides of the creek. In late September, they were “mustered into “The Augusta Rifles". This unit was officially known as Company G of The Third Georgia Infantry Battalion. It consisted primarily of soldiers from Richmond County, but also included a couple dozen from Montgomery County. The four brothers/cousins were the only Bulloch/Emanuel natives. On October 8, 1861, they arrived (via rail) at Lynchburg, Virginia. A few days later, they were sent back South to Goldsboro, North Carolina. This was an important railroad town and was also the home of many Pro-Union Sympathizers. Governor Henry T. Clark was concerned that a rebellion against the secessionist government of North Carolina was “in the making” and he requested help from The Confederate War Department. The Third Georgia Battalion was one of the units sent there to “police this potential disturbance.” While there, they also guarded some Union Prisoners who had been captured at First Manassas. The Third Battalion was headquarted at the racetrack and therefore slept on hay inside the horse stables. In early November, they caught the train back to Virginia. Once again, after being off of the train for scarcely an hour, their orders were changed. They were needed in Eastern Tennessee They left Virginia, never to return. For the duration of the war, they would fight in the western theatre of operations. In late 1861, the mountains of East Tennessee were full of Tories (Union Loyalists). These ambushers, bushwhackers, bridge-burners, and guerilla style fighters made life miserable for The Confederate Troops who were stationed there. While there, The Third Georgia was assigned to protect strategic bridges, mountain passes, and railroad lines which were vital for both communication and transportation purposes. Company G, along with other “selected companies” would often go on “night raids. Colonel James Raines, a native Tennessean, often led these excursions. On one such mission, they captured three Tory Bridge-Burners. Two were promptly hanged. The other was spared because he was only a young teen. After receiving “some severe corporal punishment,” he was released. The Rebel Raiders knew that he would tell his story to other prospective bridge-burners. During this time, there was at least one company of Cherokee Braves in the same brigade as the Third Georgia. These Native Americans had somehow escaped Andrew Jackson’s Trail of Tears and had remained in the North Carolina mountains. These Cherokee Scouts were quite familiar with the mountains of western North Carolina and Eastern Tennessee. Without a doubt, they were more than indispensable to the Confederate Forces there. In the spring of 1862, the Third was assigned to guard Cumberland Gap. About the time that The Army of Northern Virginia lost at Antietam (Sharpsburg), the Augusta Rifles headed north to participate in Kirby Smith’s Invasion of Kentucky. After retreating into Southeastern Tennessee, they became part of Braxton Bragg’s Army of Tennessee. They would participate at Stone’s River, The Tullahoma Campaign, McLemore’ Cove, Chickamauga, Missionary Ridge, and The Atlanta Campaign. William J. Bird would be wounded at Stone’s River, Chickamauga, and Missionary Ridge. He received head wounds at both Stone’s River and Missionary Ridge. Ironically, he would be the only one of the four to surrender with Joe Johnston at Greensboro, North Carolina. The other three would be in Northern Prison Camps. Berry Daughtry would be the first to be captured by the enemy. On May 5, 1863, the Third Georgia Battalion would be dissolved. Three companies would become The Fourth Battalion of Georgia Sharpshooters. Their Commander was Major (later Colonel) Theodore Caswell of Augusta. The boys of the “old Company G were now Company A, Caswell’s Sharpshooters. On June 24, 1863, Berry was shot out of the top of a tall Pine during The Battle of Hoover’s Gap. He was hit in the leg by a member of The Famed Lightning Brigade. They were mounted Union Infantrymen who were armed with Spencer Repeating Rifles. He was imprisoned at Fort Delaware until he was paroled/exchanged in February of 1865. Allen Wilkinson was seriously wounded at Chickamauga and was hospitalized until April of 1864. On the eve of The Battle of Peachtree Creek, he was captured by Federals under the command of General William T. Sherman. He was on a scouting detail on the North side of the creek. He was behind enemy lines. Josh Daughtry was with him. Although hospitalized more than once with Camp Fever (Typhoid) and Pneumonia, Josh was the only one of the four to avoid being shot. Somehow, he managed to dodge all Yankee Minie balls and other deadly projectiles. About three weeks before Appomattox, Allen and Josh decided to sign oaths of allegiance to The U.S. Government. It was a way out of the Purgatory known as Camp Douglas. Self -Preservation is a powerful force. As part of this agreement, they were required to enlist in a company of The Fifth U.S. Volunteer Infantry. This was one of six regiments of ex-Confederates who were recruited from Union Prison Camps in The Mid-west. Although they were recruited to fight Indians out West, they mainly escorted stagecoaches and wagon trains. They chased away more Indians than they fought. The Cheyenne and Sioux were the most feared and respected tribes, which they encountered. In November of 1866, the Fifth Regiment was finally disbanded. In late 1866, Allen and Josh finally made it back home. They had been away for over five years. 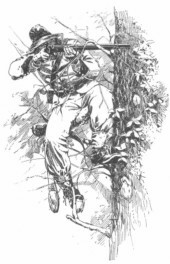 Popular targets of Rebel snipers were often high-ranking and important Union officers, members of Yankee Artillery Units, and enemy sharpshooters. Since the typical Southern sharpshooter was often starved, emaciated, shoeless, clad in gray rags, and quite deadly, members of The Union Army bestowed the nickname of “Gray Wolves” upon them. Although initially intended as an insult, it became almost a compliment to these expert marksmen It was indeed a metaphor with much substance. 1901 and was the only one to receive an Indigent Confederate Pension.” After The War, he married the widow of one of his cousins who had died from wounds received at Missionary Ridge Lucy was several years older than William and had several children by him. In his last years, Lucy either left William or ran him off. He spent his final years living with one of his daughters (wife of John Williams) and her husband near Jimps, Georgia-- in Bulloch County. His three war wounds plagued him for as long as he lived. He, no doubt, cursed the “Hated Yankees” for as long as he lived. His burial site is unknown, but is thought to be in a private cemetery in Bulloch County. Lucy Bird outlived her estranged husband by nearly fifteen years. She is interred at Upper Lotts Creek. She was eighty when she died. William was only 58. The four years of war were quite costly to this old gray warrior. Berrien Daughtry died on January 3, 1907. His old Confederate cardiac muscle finally stopped. He was nearly 65. He left a widow and eight children. He married Sarah Lanier in February of 1867. After 1880, they moved near Register, Georgia. He was a successful farmer and acquired quite a bit of land and property. He may have been one of the first to build a man-made fishpond in Bulloch County. Sarah died in 1917. They are at rest together at Lake Cemetery. Their oldest son, Ellerbee Daughtry is known as “The Father of Portal (Georgia). One of Berry’s Granddaughters is a Pediatrician in Alpharetta, Georgia. Dr. Leila Daughtry Denmark is now 106 years old! The Grim Reaper came calling on Joshua Daughtry on February 20, 1911. At the time of his death he was quite wealthy and a leading citizen of the town of McRae, Georgia. He was 71. He was a successful farmer, businessman, and an entrepreneur of sorts. His second-grade education carried him far into the business world. During the summer of 1867, he married Roxie Bird, one of his third cousins. They raised a large family living first in Tattnall (near Collins) and later in Telfair (in McRae). Roxie died in 1914 and they are buried in Oak Grove Cemetery (City) in McRae. Ironically, the Oldest Old Warrior lived the longest. Allen Wilkinson departed this life in early August of 1914. He died here in Metter. He was 74. In January of 1867, he took Susan Holloway as his bride. They farmed in Emanuel County until the late l890’s. At that time, they bought eleven acres in the township of Metter and moved to town. Of their eleven children, eight lived past early childhood. Their son Benjamin was the defendant in one of the first murder trials ever held in Candler County. At the time of the shooting, he was Constable of Metter. In August of 1915, he was acquitted. Susan outlived all but two of her children. She lived almost two decades longer than her husband. After his death, she was able to collect a “Widow’s Pension.” Much of the information on her Pension Application is incorrect. Apparently he told her very little of his “War Experiences.” It, no doubt, was a period of his life, which he often chose to forget. But, generations later, some of us have chosen not to forget. We have labored diligently and tenaciously to uncover the truths and realities of how it must have been to serve under “Saint Andrew’s Cross.” But, the real truth will never get into the books. Words cannot express what our ancestors were forced to endure. The magnanimous, old, warriors in gray shall never be forgotten. They shall forever live on inside our sons, our daughters, and us. After all, the burial of the truth is the most flagrant form of dishonesty. We simply cannot allow that to happen. NOTE: Allen and Susan Wilkinson are buried together at Lake Cemetery. Their graves are presently unmarked.